Dreidels, menorahs, and gifts! This special Jewish holiday involves many special traditions. These Hanukkah resources highlight some of the more common activities and rituals that families engage in to celebrate Hanukkah. Your students can learn about Hanukkah and participate in some Jewish celebratory practices with games, baking, and craft ideas. See other winter and seasonal activities in our Holiday Season resources. Make a Holiday Card: Happy Hanukkah! Hanukkah is coming up, and what better way to usher in the holiday than with a homemade holiday card. Hanukkah gift tags add a special something to your holiday presents. Print, cut, and colour Hanukkah gift tags with your child this winter. Put your fifth grader's holiday knowledge to the test with a colorful crossword puzzle full of trivia clues all about Hanukkah! 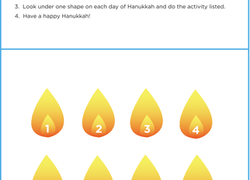 Countdown to Hanukkah with this fun menorah worksheet. You can countdown to Hanukkah by adding paper flames on each menorah candle. Make some Hanukkah cards with this festive printable. 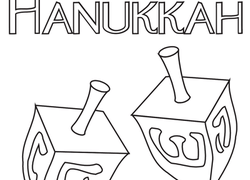 This Hanukkah card is great for wishing friends a Happy Hanukkah, and lets your child colour and decorate. This Hanukkah word search kicks it up a notch by only giving clues to the words in the puzzle. Celebrate the Festival of Lights by sending a homemade Chanukah greeting to someone special.